Hard on the heels of its all-new 2015 A3 small sedan, Audi this fall will launch its first luxury compact crossover to take on the likes of BMW's X3, Infiniti's QX50, Lexus's RX, Mercedes's GLK and Lincoln's soon-to-come MKC. Filling out the range of Audi CUVs that has so far included just the size-larger Q5 and larger-still Q7, the A3-based Audi Q3 took its U.S. bow at January's North American International Auto Show in Detroit. While a more fuel-efficient four-cylinder turbodiesel will likely come later, the 2015 Q3's standard and only powertrain will be a 200-hp turbocharged, direct-injected 2.0-liter four driving its front wheels through a 6-speed Tiptronic automatic transmission. Audi quattro permanent all-wheel drive and an Audi drive select system offering a choice of three response and handling modes (Comfort, Dynamic and Auto) will be available. 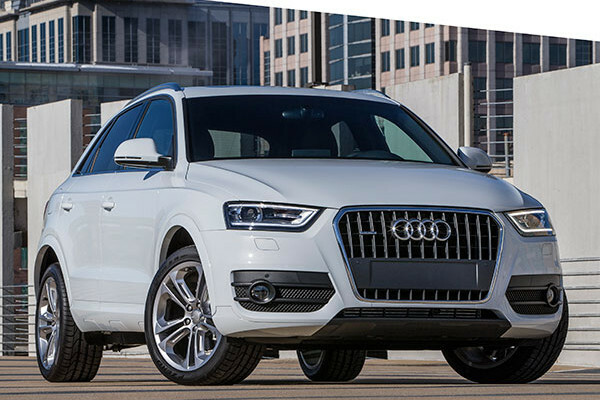 The Audi Q3's carefully crafted cabin seats four adults in quiet comfort, plus a fifth when needed. Cargo capacity is 16.2 cubic feet with the split rear seatbacks upright and 48.2 cu. ft. with them folded down. Dramatic LED interior lighting illuminates the doors, foot wells, vanity mirrors, storage compartments, the air vent thumb wheels and even the cup holders. Front airbags, thorax-pelvis side bags (in the backs of the front seats) and side curtain head airbags are standard. Rear side airbags are optional. Audi promises a sport-oriented balance of agile handling and smooth ride. The front suspension is McPherson struts with forged aluminum lower wishbones, the rear a four-link axle with a separate spring/shock units that maximize cargo space. Electromechanical power steering with speed-dependent power assist, electronic stability control (ESC) with off-road mode and hill descent assist, and 18-inch alloy wheel are standard, 19-inchers optional. Standard equipment will include leather upholstery, a panoramic sunroof with power retractable sunshade, 12-way power heated front seats, Audi's advanced key system, xenon-plus headlamps and LED DRLs, taillights and mirror-mounted turn signals. Among the available optional features will be a Sport Package with adjustable-thigh-support front sport seats; a Driver Assistance Package with a rearview camera, Audi Parking System and Audi Side Assist (which uses radar to assist in safe lane-changing); Audi MMI Navigation Plus with a 7.0-inch color screen; a power tailgate with remote actuation and a programmable preset opening angle; a 465-watt, 10-channel, 14-speaker BOSE Surround Sound system; and a Prestige Trim Package of convenience and infotainment features, including Audi Connect. This Audi Connect infotainment system provides Wi-Fi connectivity for up to eight wireless devices (for passengers); Google Earth maps for an aerial view of your navigation route; a myAudi Destination feature that allows you to log on to Google Earth from virtually anywhere in the U.S. and download up to 50 destinations to the vehicle; Google Voice Local Search for detailed information about travel destinations such as restaurant or hotel hours, pricing and customer reviews; Sirius/XM Traffic information (subscription required); and real-time localized weather, news and live fuel prices.